The proof of premature seam failure on the flag plate is decisive when verifying an articulated beam connection with JOINTS. What exactly does the proof of premature suture failure take into account and must it always be managed? This verification is conducted in accordance with the ECCS. 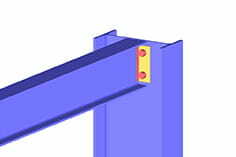 This requires that the weld must not be decisive for the load-bearing capacity of the connection. The carrying capacity of the weld must therefore be > the load-bearing capacity of the flagstaff. So if this review is not respected, so either the weld thickness can be increased or the thickness of the flag plate can be reduced. In the verification details, the minimum thickness of the weld is output with which the requirement is met.